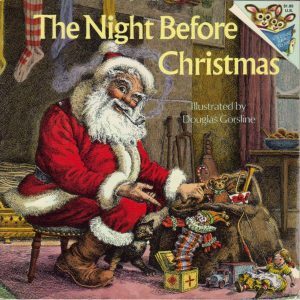 Following family tradition, the bedtime book I read to my near-four-year-old son on Christmas Eve was “The Night Before Christmas”, aka “A Visit from St. Nicholas”, by Clement Clarke Moore*. I used my mum’s old copy of the poem, a picturebook lavishly illustrated by Douglas Gorsline. As I read it aloud, another poem kept coming into mind: J.R.R. Tolkien’s “Over Old Hills and Far Away” (1915). This is one of only two poems about Tolkien’s elusive early character, Tinfang Warble, variously described as a “leprawn” (Tolkien’s idiosyncratic spelling for “leprechaun”), a “fay”, an “elf”, or a “quaint spirit” of mixed origin. Tinfang Warble also appears in The Book of Lost Tales, the earliest draft of what we know today as The Silmarillion. 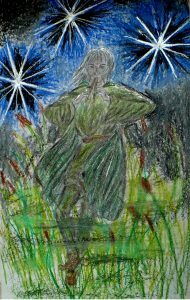 In “Over Old Hills and Far Away”, Tinfang Warble is clearly a “fairy” creature, akin to other such (often small or even diminutive) beings in Tolkien’s early poems**. Tinfang is described as a white-haired “old elf”, who is, nevertheless, a merry piper, lithe and nimble, running fervently and dancing, and eventually luring the speaker of the poem to follow his piping. “Twas the Night Before Christmas” – probably one of the best-known Christmas poems ever – is, of course, about the nightly visit of St Nicholas to leave presents for some children on Christmas eve, as spied by their father, who wakes up to witness his arrival. So what is the connection? 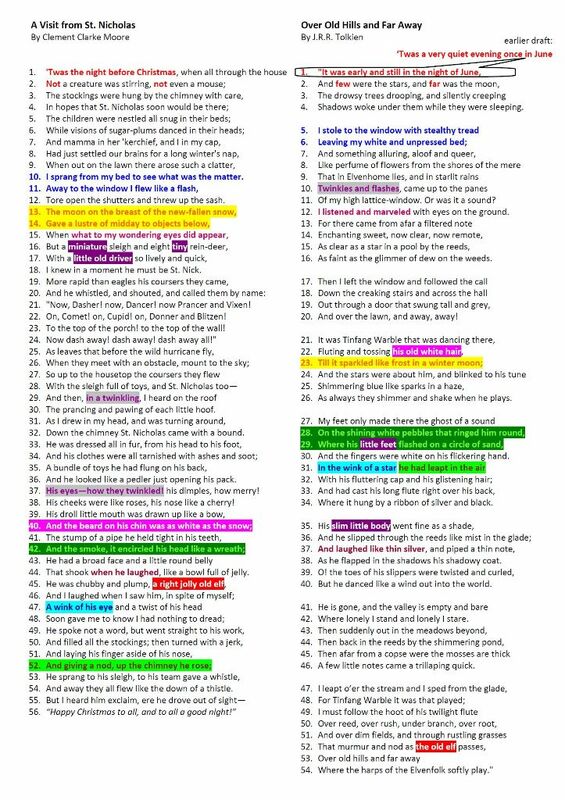 I have tried to show a number of parallels and similarities in these colour-coded versions of the two poems, which I will explain further below. The two openings seem to chime in other ways too: in both first lines we have an indication of time (the night before Christmas vs. a night of June) and Tolkien’s first draft was even closer to Moore’s, shortening ‘It was’ to ‘Twas’: “‘Twas a very quiet evening once in June”. Though Tolkien’s poem takes place in the summer, while Moore’s poem is emphatically set in the snowy winter, Tolkien describes Tinfang Warble’s white hair as sparkling “like frost in a winter moon” (l. 23). Moore’s moon, on the other hand, is also associated with bright light: as it falls “of the new-fallen snow” (l. 13) it gives “a lustre of midday to objects below” (l. 14). Sun/moon, summer/winter – we have a number of mixed metaphors and images here. Our two protagonists, St Nicholas and Tinfang Warble, also show a number of similarities, not only on a lexical level, but in terms of imagery too. They are both small, little, even diminutive: St Nicholas is “little” and drives a “miniature” sleigh driven by “tiny” reindeer (ll. 16-17); while Tinfang Warble has “little feet” and a “slim little body” (ll. 29, 35). They both have the ability to leap high (up the chimney, l. 52, or up in the air, l. 31, respectively) and they both laugh happily. Most importantly, they are both old, with white hair – indeed, St. Nicholas is memorably described as a “jolly old elf” (l. 45) while Tinfang Warble is “the old elf” (l. 52). It was this last parallel, alongside the sing-song metre of both poems, that initially spurred my interest to look closer and compare these two compositions. The narrators of the two poems also show remarkable similarities: they are both awoken at night, hearing something in their sleep, and they both approach their respective windows to find out what is going on (ll. 10-11 and 5-6 respectively). They both then spy on their otherworldly visitors – though Tolkien’s speaker goes one step further by following Tinfang, almost compulsively. In the colour-coded picture above, I have noted a few other – less pronounced – connections in terms of structure, lexis, and imagery. Now there is, of course, nothing Christmassy about Tolkien’s poem, but there is most definitely something elvish about Moore’s poem. Moore’s poem was certainly as popular in Britain from the second half of the 19th century on as it was on the other side of the Atlantic, and there were numerous illustrated editions that became ubiquitous and very influential in the shaping of the modern, now universal, Santa Claus. Moore’s poem is whimsical and jolly and not taking itself too seriously – a marked difference from the nostalgic, wistful tone of Tolkien’s poem. For me, however, the image of the tiny, white-haired “old elf” that moves nimbly and draws the attention of the speaker, rousing him from his bed, is a tantalizing link between the two poems, underlined musically by their anapestic rhythms. 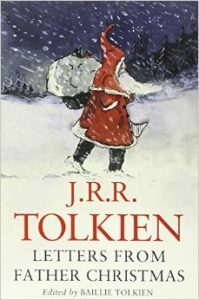 Tolkien did go on to create a Christmas mythology (parallel to his Middle-earth legendarium) in his Letters from Father Christmas, and his central character – the British equivalent of St Nicholas/Santa Claus – is indeed whimsical and dressed in red and white (a tradition that originated with early illustrations of the American figure – as opposed to the usually green garments of early depictions of Father Christmas). But I like to think that Tinfang Warble has something Christmassy about him too – if only some vague echo of Moore’s “jolly old elf”. * Though the authorship of the poem is contested – some scholars have argued it was written by Henry Livingston, Jr.; see here for an overview of the controversy. ** For Tolkien’s “fairy” creatures in his early mythology, shaped by folklore, Victorian fairylore and fairy paintings, see Chapters 2, 3 and 4 of my book, Tolkien, Race and Cultural History, as well as my article here. “Over Old Hills and Far Away” can be found in The Book of Lost Tales I, pp. 108-10. “A Visit from St Nicholas” is out of copyright and can be accessed freely online – here is a good version. when you posed the question of what links the two poems, the meter was the first thing that came to my mind. Anapests are wonderful, but they are uncommon in English as you say. (But they are used to good effect by, of all people, Cyndi Lauper in the chorus of “Time after Time”: “if you’re lost, you can look, and you will find me” — 3 anapests and a spondee, giving a nice emphasis to the final three words — who says studying prosody is useless?). But it’s the verbal echoes between the two poems that remind me of the echoes between Tolkien’s Man in the Moon poems and our Man in the Moon nursery rhyme, with the nursery rhyme “preserving” the memory of the “originals.” Then, too, of course, there’s Sellic Spell. I wonder if Tolkien was doing something of the same here? I just realized noticed ‘quaint’ above. In Sir Orfeo ‘queynte’ is used of the fairies.